Valentines Day is barely passed and I am already onto St.Patricks Day. Target has it's St. Pattys t-shirts all ready to go. 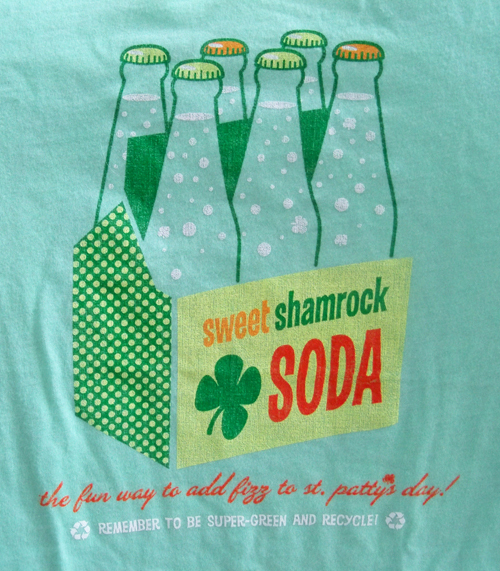 I loved this Sweet Shamrock Soda one. It even has green recycling messaging! luv Target's holiday tees; but especially luv their holiday socks. Already picked up two pair. where do they have these in the store? I never see any holiday apparel except for in the tots section. These shirts are in the PJ section. Are there other patterns? I only saw this one at my Target. Then again, it's early. I won't rant on why they don't have these cute designs on "regular" t-shirts that I'd feel comfortable wearing in general public.